Whole grains, whether truly “whole” or not, have gone mainstream. It gets more complicated. Manufacturers claim processed foods are, or contain, whole grains when it isn’t true. Debates rage about the relative benefits of “whole grain” pasta versus the real thing. Then there’s the “are whole grains even good for you?” thing. Feh. You shouldn’t care. They’re fantastic. What they’re not is a panacea, or a substitute for anything except the hyper-processed grains that replaced them in the first place. But at this point, the widespread, almost universal availability of farro, quinoa and millet alone would be more important and valuable than all of the gorgeous heirloom beans that have been rediscovered in the last decade. Legumes we already had; these are new to most of us. Throw in spelt, kamut, wheat berries and brown rice, along with the semi-processed bulgur (cracked and steamed wheat) and steel-cut oats, as well as couscous, which is usually treated as if it were a grain, and kasha (buckwheat groats, which few people seem to like), and it’s a new world out there. This isn’t even a complete list. They are all filling, chewy, satisfying, delicious options that complement both meat and vegetables as perfectly as, well, white rice. With more flavor, more texture, more fiber. These questions seem to baffle many people: 1) How do you cook them? And 2) What do you do with them? These are the answers, in short: Until they’re done. And whatever you’d like. 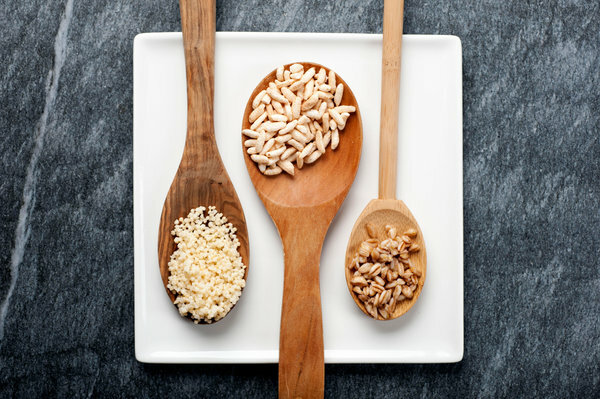 Cooking can take as little as five minutes (for bulgur) or as long as an hour (for wheat berries), but that doesn’t matter. If they threaten to dry out, you add water, preferably boiling, so as not to slow down the cooking, but don’t worry if you forget. If they’re soupy when you’re done, drain them. There are a zillion other techniques, but you don’t need to know them. As to what happens next, I’d nominate grain salads as the way to go, especially this time of year. There is one mistake many of us have made in producing grain salads: we’ve not only featured grains, we’ve downplayed everything else. A pile of cold brown rice with a few chopped vegetables and some soy sauce or a mound of wheat berries with vinaigrette is about as one-dimensional as it gets. As great as the grains are, they cannot stand alone; they are role players. They need vegetables, fruits, meat or fish, and they need well-thought-out sauces. As with plain rice, there’s nothing wrong with any of these under a stir-fry, or with a pat of butter for that matter (and plenty of salt and pepper). But if you want a grain that people will really notice, you have to treat it right. The millet with corn, mango, shrimp and arugula — and peaches! (or mango) — is a riot of color and flavor and, I think, the best use of millet I’ve ever found. Here its grassiness seems an advantage rather than a drawback. If you don’t want millet, or don’t have it, I’d go with couscous. Finally, there’s a puffed brown rice salad. You can shoot white rice from cannons (or however it’s done), load it up with sugar and call it breakfast cereal. Or you can treat brown rice the same way, forget the sugar and turn it into something that’s as amusing as it is delicious. Yes, there is a load of big-flavored and interesting ingredients here. But the point isn’t just to eat whole grains “because they’re healthy.” The point is to enjoy them because they’re good. This entry was posted in Uncategorized and tagged Millet, Oats, Rice by admin. Bookmark the permalink.